The concept of “habit” is seeing a bit of a resurgence among philosophers and theologians. Thomas Aquinas, centuries ago, had emphasized the importance of spiritual habits, but the concept has been overlooked for some time. James K.A. Smith rejuvenated the idea in his cultural liturgies work (Desiring the Kingdom), and Kent Dunnington gave a thorough treatment of the subject in relation to addiction (Addiction and Virtue). 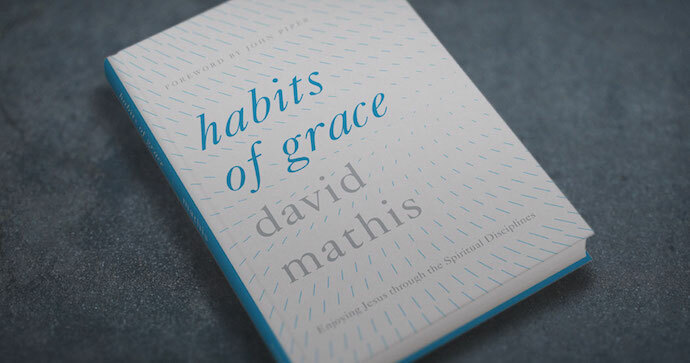 In Habits of Grace, David Mathis uses the concept of habits to reorient our understanding of the so-called spiritual disciplines in a way that simplifies our effort and magnifies God’s grace. Mathis desires to keep the gospel always front and center, even in the discussion of spiritual disciplines. This means, for him, that even as we talk about “the various personal habits fo grace that we develop” we do so in the knowledge that they are simply a means of putting ourself in the flow of God’s grace. These disciplines do not, in and of themselves, merit God’s favor or blessing, or accomplish our growth. This is an important qualifier and one that sets Habits apart as a unique work in the field. In fact, I wish there had been more discussion along this point. Mathis’ work is very good, but after the first few chapters it does begin to feel a bit like many of the other standard works on the spiritual disciplines. It mimics the work of Donald Whitney often, paralleling it at points, outright quoting it at other times. The general thesis of the work is referenced again at various points throughout the work, usually at the close of a chapter, but it is more a cursory reminder than a shaping framework. The book could have been more unique had that shaping influence dominated each discipline. As it is, however, the book is still commendable. Mathis’ other great contribution to the discussion is his simple approach to the plethora of disciplines commonly delineated. While many others have a tendency to heap the mountain of responsibilities upon us as Christians, Mathis is careful to narrow the details to three categories: hearing His voice, having His ear, and belonging to His body. The three categories cover disciplines of the Word, Prayer, and fellowship. He builds his case for these divisions from consideration of Acts 2:42. The simple division is helpful in alleviating some of the stress and anxiety that discussions about the spiritual disciplines can engender. Mathis is sensitive not to put more on the believer than God’s Word itself does. He notes the value of reading daily, but also observes that it is not a requirement. He observes the important of journaling, yet is reluctant to mandate it for all. His sensitivity, likewise, is fresh air. Too much discussion about spiritual growth heaps mountains of burdens upon already fragile and discouraged Christians. Mathis invites us into growth, rather than lambasting us for weak effort. Overall I found Habits of Grace to be a wonderful book. It is easy to read, engaging, and simple. Many new and mature Christians will find this a help in their own spiritual development. Mathis contends that his is not the best work on the disciplines, and that students will want to read the more advanced works. In actuality, Mathis says many of the same things that these other works do, but he says it in a way that is simple and sensitive. I highly commend this book on healthy habits to every Christian. Habits of Grace will encourage your spiritual life and defuse your anxieties about it.